The letter which I had the honor to receive from you under date of yesterday states among other things that in Genl. 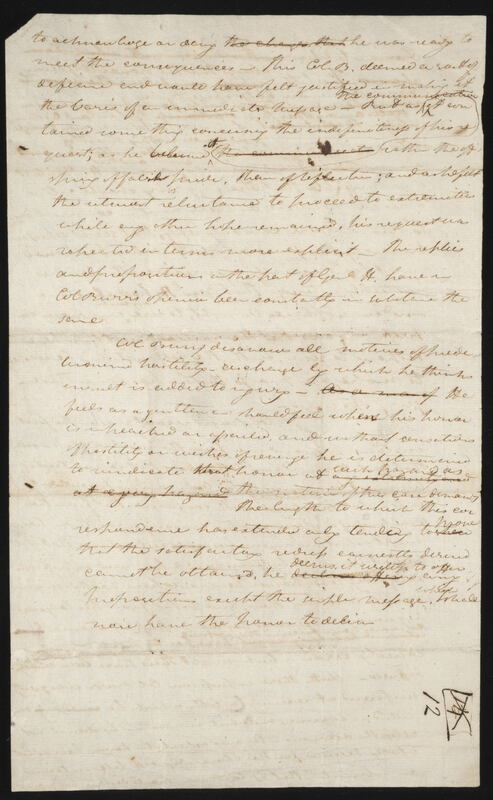 H.’s opinion Col. Burr has taken a very indefinite ground in which he evinves nothing short of predetermined hostility and that General H. thinks it inadmis- sible that the inquiry should extend to his confidential as well as other conversations. To this Col. Burr can only reply that secret whispers traducing his fame and impeaching his honor are at least equally injurious with slanders publickly uttered, that Genl. H. had at no time and in no place a right to use any such injurious expressions, and that the partial negative he is disposed to give, with the reservations he wishes to make, are proofs that he had done the injury specified. Col. Burr’s request was in the first instance proposed in a form the most simple in order that Genl. H. might give to the affair that course to which he might be induced by his temper and his knowledge of facts. Col. B. trusted with confidence that from the frankness of a soldier and the candor of a gentleman, he might expect an ingenuous declaration, that if, as he had reason to believe, Genl. H. has used expressions derogatory to his honor, he would have had the magnanimity to retract them, and that if, from his language, injurious inferences had been imprperly drawn, he would have perceived the propriety of correcting errors which might thus have been widely diffused. 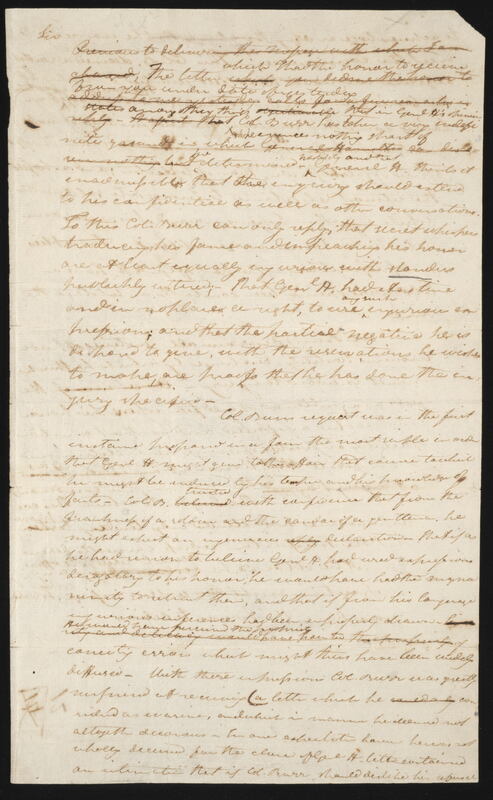 With these impressions Col. Burr was greatly surprised at receiving a letter which he considered as evasive, and which in manner he deemed not alto- gether decorous. In one expectation, however, he was not wholly deceived, for the close of General H.’s letter contained an intimation that if Col. Burr should dislike his refusal to acknowledge or deny, he was ready to meet the consequences. This col. B. deemed a sort of defiance, and would have felt justified in making it the basis of an immediate message. But as the communication contained something concerning the indefiniteness of the request; as he believed it rather the offspring of false pride than of reflec- tion, and as he felt the utmost reluctance to proceed to extremities, while any other hope remained, his request was repeated in terms more explicit. The replies and propositions on the part of Genl. H. have, in Col. Burr’s opinion, been constantly in substance the same. Col. Burr disavows all motives of predetermined hostility, a charge by which he thinking insult is added to injury. He feels as a gentleman should feel when his honor is impeached or assailed; and without sensations of hostility or wishes of revenge, he is determined to vindicate that honor at such hazard as the nature of the case demands. The length to which this correspondence has extended, only tending to prove that the satis- factory redress, earnestly desired, can not be ontained, he deems it useless to offer any proposition except the simple message which I shall now have the honor to deliver. Wednesday morning, June 27, 1804.